The Holms & The Maine Incident! – Kent Hovind v. Robert Baty – The Great Debates! Home→The Holms & The Maine Incident! 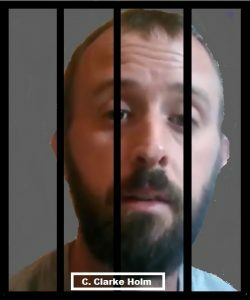 In recent days C. Clarke & Danielle Holm, the parents of “Baby Holm”, have been pressed for details of the recently admitted arrest of C. Clarke Holm and the towing of their vehicle. In response, an account was posted to FaceBook which reveals an account of the incident but which leaves much to be desired as is typical of the Holms’ story telling. 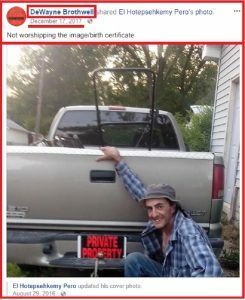 It does provide further evidence that the Holms have been intent on practicing their sovereign citizen theology and in this case to the point of getting C. Clarke Holm arrested and their vehicle towed. We are having trouble posting what Danielle sent me so I am trying it this way. Danielle is presently unable to lose her hacker and still would like to comment. Susan Cobb is correct. And this was another very very very obvious targeted situation. Could not be more obvious. The first couple of hours in Maine, first time stopping, at a gas station to get gas. I was in the passenger seat. Had no idea a cop pulled into the gas station. Christian was just pumping gas and was just going to jump back in so we could be on our way. We still had another 3 1/2 hour drive. I was actually on the phone and realized he was taking a long time, so I looked towards the pump, did not see him. I turned all the way around, to the back of the vehicle and saw a cop standing at the pump (pump still in the tank) speaking to Christian. Was not weird to me at first, because we speak to many cops, on purpose, about our situation, pick their brains, speak the obvious to them, etc…so I immediately thought that was what Christian was doing because the cop was parked and his lights were not on. So, I got out of the car, walked to the back and immediately the cop yelled at me, to get back in the car. I looked back at the cop about to ask why he was telling me to get in the car, and the cop yelled at me again, to get in the car. I sat and sat and sat and sat. I put the window down and heard Christian as always speaking calmly, answering their questions and asking them questions. All of a sudden 3 more police officers show up. Of course, I am content with the Creator, but I knew something was not good and about to happen because I felt it and it made me feel ill because of everything else we are going through. Christian felt it too but just kept standing there. So, without going into all of that, I said where we had just come from and where we were going in that moment. He asked for my ID. I have never in my 34 years of life, EVER been asked for my ID for sitting in the passenger’s seat of a car, while not driving. What if I did not have one? NOTE: Soon EVERYONE WILL NEED the fictitious character name/ID, or you will be threatened with jail or your life. It is quickly becoming mandatory if you breathe you need to prove it with ID. This was literally about a 30 second conversation and I simply asked that one question. Of course knowing what we have already been through, with people that literally break ALL of their own laws, I knew they were NOT kidding. So, I asked him if I could get out of the car to go to the back to open the back to get my bag where my IDs were. My bag was nowhere near me, because I very rarely use it. He said he would open the back and look. I told him, no. He is not going to open my car and search anything and touch my bag because this is further invasion in our lives when we were simply pumping gas. NOTE: This does NOT mean we have things to hide like some of the trolls say. This means the world is getting OUT OF CONTROL and the more we COMPLY with their horrid DEMANDS, the LESS FREE WILL we will have to just LIVE when not even doing anything wrong, or bothering anyone. We were LITERALLY pumping gas, once again traveling through the state. We were in that state for about 2 hours at this point. Immediately upon stopping this happened. So, the cop eventually “ALLOWED” me to get out of the car, and walk to the back to get my ID. He took my ID, and that was that. They still did not allow me near my husband. I went back into the car for another 15 minutes or so. I then, was told to get OUT of the car, and speak with the other officers and that they were currently “detaining my husband”. At this time, they were harassing Christian, mocking him, laughing at him, as he was sitting in the back of one of the cop cars. I heard Christian calmly say to one of the officers, “Do you realize you are destroying the love of the Creator and trying to take away my free will?”. These officers, including a detective thought this was hilarious. One of the officers said, near me as he started laughing, “he just keeps talking about love and free will” . NOTE: A detective came onto the scene to be a big help for the false arrest, and give the “OK”. So, as I am standing outside of the car, the police officers (who are now questioning me about my life, where we “live” why we are in Maine, etc…I answered all of their questions, all while asking them why they were holding my husband hostage. They said, “ma’am, he has given us a false identification. Too bad for these officers, they may or may not have realized that we have already gone through this MISTAKEN IDENTITY fiasco which resulted in the KIDNAPPING OF OUR CHILD….FBI cleared him, the sheriffs department cleared him, and it was already testified on the stand by a DETECTIVE that Christian has never lied about his “identity”. He does not have a record, does not get into trouble and simply speaks truth while asking questions. So, as I am pleading my husbands case, I am surrounded by 3 police officers who are looking at me, like I am entertaining, because I am calmly speaking to them, pleading the case to them with facts, humility, and trying to incorporate humor as well, lighting it up a bit, so they can at least relate because all they care about is joking around like children. as they really could care less about everything we are having to go through. Christian was getting arrested, and that was that. To top it off, they were calling a tow truck to come impound our car, that we had just bought in another state that had temp tags from the state we bought it from, because we didn’t have an address in the state we bought it from, and we were in the process of figuring out paper work with our home state, to register our vehicle while traveling out of state, because we at this time, were running around the country getting everything we could get done for OUR BABY. We were in this process and trying to get it all done fast to not be harassed and sure enough we are harassed IMMEDIATELY!! And its not like we did not even have plates! We had an out of state TEMP TAG. The tow truck came, there was nothing I could say to make anyone there care or listen. I am in a parking lot, Christian is in the back of a police car, they aren’t letting me speak to him (divide and conquer), and now a tow truck is coming to take our car. Cop said, “I don’t know, just wondering.” ……..I am putting these details so everyone can see the mentality. So, I start quickly trying to gather my belongings, as the police officers are not really technically searching the car (because they cannot) but they are trying to. JUST LIKE AT THE HOSPITAL, we had a can of pepper spray in the car, under the drivers seat, and I have a little key chain one on my hiking bag which I had in the car with me. So, as I am pulling my stuff out of my car, they continue looking at my stuff, against my will but at this point, I don’t have it in me to challenge. So, they are not searching the car, but now they are searching my stuff that I am taking OUT of the car, and called it “taking inventory” because they were having the car towed. I attempt to get all of my stuff together, including our 2 dogs and their food, and anything I think I may need for however long I am going to be alone. I knew I was in a foreign place, they were taking my car, and husband and now I am having to figure out how to get a rental, or an uber, etc….I asked the “PROTECTORS AND SERVERS” for a ride at least somewhere safe, out of a parking lot, and they said no, that I would have to call or get a ride. I asked if they could lead me in the right direction, to the closest place to call, again they said NO. So, they DID allow me to tell Christian I love him, as I stood out in the parking lot and he drove by in the back of the car and I remember all he said to me was “I love you. Everything is going to be okay. They know not what they do. I will call you as soon as I can. “ and they drove off. There is an entirely different perspective on Christians side, as to what happened with him, and what was said, etc…but the jist was Christian was speaking to them about the Creator as he always does, everywhere we go and they just laughed and mocked and lied to arrest him. It was a game to them, and they were able to make money off of it. That’s all it was at the end of the day. They left me out on the side of the road with NO PEPPER SPRAY (because they took it all!! ), no vehicle, AND the one phone Christian and I share, Christian gave to me, and it was DYING and I left the charger in our towed car. So, that was a whole other fiasco. To end this quickly, a lot happened within the jail. A lot of unexplainable things, phones ringing off the wall, them asking Christian really inappropriate questions to push his buttons and try to get a rise out of him, kind of like what Bud Turner does and all the trolls. He remained calm, and waited to know what to do. We had made an agreement, ahead of time, many months before this, that if we were targeted again, and ever arrested, either of us, that we would not pay BAAL, because we do not believe in paying BAAL-the demon god, and these cops taking away our free will for profit. However, as Christian was in the back of the car driving away, he saw me in the parking lot alone, with the dogs and bags, with a dying phone, and no car. So, naturally his protective mode kicks in, and he immediately posts and pays BAAL as soon as he is allowed to hurry up and reunite with me so we can get back to fighting for our baby boy together as one. In the meantime, we had made acquaintances up in Maine who knew we were trying to get to the Native American tribe, and I called them to let them know what was happening, because we were planning on going up to their house. Thankfully, they came to pick me up knowing Christian may hold out, and not pay BAAL and I did not know how long he would be in there for. So, 3 hours later, I got picked up, and almost 20 minutes after being in the car with our acquaintances, Christian called me to pick him up!! It was immaculate timing and those are the moments I thank the Creator for. I was once again, traumatized, shaken up, upset and just needed us to get back on the road. For this reason, we stayed at our acquaintances house that night and left the next morning, rented a car to drive while we towed our car out of the state (mostly because I was in immense fear of police harassing us for temp tags, so I wouldn’t allow either of us to drive until our home license plates were on the car). We were having an extremely sour taste in our mouths about Maine and our one day experience there, not even able to drive another 5 hours to get to the Native American tribe. (I have been in contact over the phone however). Instead, we rented a car, towed our car away and went directly to a detective/chief at the police station to speak to someone about what happened and to let them know we were leaving their state because they just put fear into me, and I didn’t want to be there. He looked in the computer and sure enough, the false arrest was for “FALSE IDENTIFICTION”. Christian pulled out his license, showed this detective/chief and said, “this is a lie”. The guy looked at it, and just shrugged his shoulders and said, he can file a complaint, but there was nothing more he could do, and he suggested just going to court, even though we don’t live there, and were not going to be there or go back ever again. People ask me why I fear? I fear the danger that certain people in uniform bring to our lives when we are simply trying to live and serve the Creator by fighting for our baby. I have moments where I freeze, and I sometimes cannot even drive, because of the fear that these people in uniform have put me under in the last 16 months. I was never like this before, and would go to them for aid in things. It is sad that I fear the ones who are supposed to serve and protect us, the ones who simply wish to live serving others. Did they say when that incident occurred? Did they say where that incident occurred? Did they provide a copy of the police report? Did they name any of the police officers? Did they say what final disposition was made of the charge(s) against C. Clarke? Did they say what ID was provided by C. Clarke that was considered “false”? Did they give the name of the “Native American Tribe” they were going to see? Did they say where they had just come from before being confronted by the police? Did they give the status of whatever it is they are trying to accomplish with that mysterious “Native American Tribe”? Did they name their “acquaintances” that came and picked up Danielle? Did they provide any pictures or audio of any of the events? Are they, have they ever been “fighting for” Baby Holm? Did they explain how they were able to buy that new car and in what state? Did they name who they accuse of accusing them of hiding things? Did they give the name of the state they consider their “home state”? Did they name the state that issued the “temporary tag” for their new car? Did they adequately explain why they towed the car out of Maine if there was no problem with the tag? Do the Holms like to lie, misrepresent things, and keep secrets? Brady Byrum, Kent Hovind’s man who helped the Holms develop their sovcit legal strategies from the beginning, is still around and may still be involved in the Holm case.